Rehearsals are going well for Aladdin’s arrival in London next month. 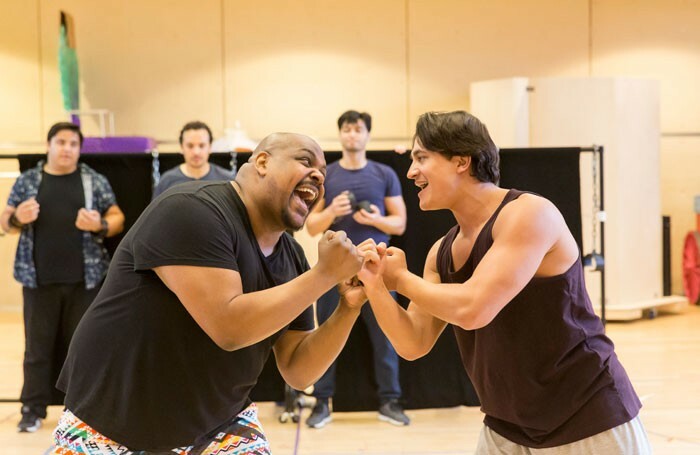 Here is Genie (Trevor Dion Nicholas) and Aladdin (Dean John-Wilson) getting to know each other. The photos of the cast working hard, but obviously having a lot of fun, have been released ahead of the first previews which start next week. Everyone is really excited about the show, including the gang here at theatrebreaks. We’ve already got ou tickets for 07 June so we will be able to tell you more then. Aladdin – the Musical previews from 27 May but doesn’t officially open until 15 June at the Prince Edward Theatre in London’s Soho. The theatre is just a few feet from the Palace Theatre where another popular show, Harry Potter and the Cursed Child, is also soon to open. Click here to get more information on Aladdin Theatre Breaks.